Queenstown has a great selection of Golf courses to suit all skill levels. Speak to the team at Relax It’s Done who can put you in touch with a local golf tour operator to make the most of your time here. Designed by Master Golfer Sir Bob Charles, and set amongst stunning alpine scenery close to Arrowtown, this course ensures exciting golf. Situated on the Kelvin Heights Peninsula, with breathtaking scenery, this course is an easy 20 minute drive from town centre. Another option for transport to this course is by an exciting jet boat ride across the lake. New Zealand’s most exclusive Golf Course owned by well known businessman Sir Michael Hill. Built to host the New Zealand Open, this course is situated next to the historic town of Arrowtown and is set over 500 acres of land. Located in Frankton Village, this course is ideal for the casual player or beginner, with lessons available and a driving range to practice . Built on the spectacular Jacks Point settlement in Queenstown, this course is a 20 minute drive from the town centre and features a delightful club house to enjoy a light lunch or drink; sit back after your game and enjoy the stunning surrounds. The Queenstown region has an impressive array of multi day walks to suit all abilities and interests. With the chance to walk through some of the most remote areas in New Zealand, this is a chance to really explore the beauty of the Southern Lakes. An experienced local guide may accompany you on your walk, provide all necessary equipment to ensure you are comfortable and safe, as well as heated accommodation along the track with meals. Milford Track– Famous throughout the globe, this walk is spectacular and you can expect to see fast flowing waterfalls and lush rain forest. Routeburn Track – This track links Mount Aspiring with Fiordland National Park and features lush Beech forest and plenty of wildlife. Skyline Gondola and Luge is New Zealand’s only gondola assisted bike lift – transporting you and your bike direct to Queenstown Bike Park. With more than 12 world class biking trails with varying terrain, this park will appeal to all mountain bike enthusiasts! The longest run being 6km. Half day, full day or 3 day passes are available for purchase at the ticket office at the base of the Gondola, or you can also purchase them online here. Queenstown also boasts a variety of bike tracks to suit all skill levels – from a scenic cycle around Lake Wakatipu to a wine tasting day along the Gibbston Valley trail. 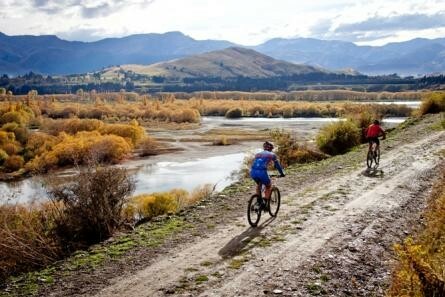 Queenstown Trail provides detailed information on all trails in the region, and allows you to plan your ride. View their video here to see first hand the stunning scenery, or view their website here. Our privately owned holiday homes are perfect for storing bikes and equipment, many have large secure garages for your use. View our portfolio for what’s available to suit your group. Queenstown boasts two spectacular ski fields with world class facilities, superb conditions and fantastic views, with transportation available to each mountain from the town centre. Coronet Peak has built a reputation for some of the best and varied terrain in Australasia and developed a truly international flavour. Only 20 minutes from town centre, Coronet Peak has stunning views over the Wakatipu Basin and features diverse terrain, a half pipe, terrain park and a dedicated beginner and novice area. Remarkables Ski Field offers something for everyone from all levels, with a relaxed atmosphere and sun- kissed north facing slopes; boasting three sheltered bowls, challenging terrain for the advanced and magnificent views out over the Southern Alps. The Remarkables ski field has a brand new base building, where you may enjoy sipping on a mulled wine and is the perfect location to keep an eye on children in the nearby learner slopes. Neighboring ski fields located near Wanaka are Treble Cone and Cardrona Alpine Resort. Transport is available from Queenstown centre for day trips. Enquire for more information or check availability of our holiday homes here. Contact us on [email protected] or +64 3 4411510 / +64 27 4471304 for more information or to discuss your holiday plans.